Buy tickets direct from Eurostar at www.eurostar.com & print your own ticket. Bookings usually open 180 days ahead. Business Premier & Standard Premier = 1st class with drinks & meals. Standard = 2nd class. NEW: If you are happy booking shortly before travel - or actually need to go at short notice - and OK leaving the exact departure time up to Eurostar, there's a new Eurostar Snap option only sold on a special Eurostar mini-site, see the information below. Eurostar is the high-speed passenger train linking London with Paris, Lille & Brussels via the Channel Tunnel at up to 300km/h or 186 mph. Eurostar is owned 55% by SNCF French Railways, 5% by SNCB Belgian Railways & 40% originally by the UK government but now sold to overseas investors. Don't confuse Eurostar with Eurotunnel, who own the Channel Tunnel and whose car-carrying trains shuttle vehicles across the Channel. Eurostar started running in 1994. This page explains all you need to know about travel by Eurostar between London and either Paris, Lille or Brussels. Direct Eurostar to Rotterdam & Amsterdam - new in 2018! The video shows a new Eurostar e320. See video featuring older Eurostar classic trains. Eurostar runs from London St Pancras to Paris Gare du Nord every hour or so, 7 days a week all year round except Christmas Day. London to Paris is 491.8 km or 305 miles. Fastest journey time 2h15 non-stop. Some Eurostar trains stop to pick up passengers at Ebbsfleet International near the M25 & a handful stop at Ashford International in Kent. A few Eurostars also call at Calais Fréthun, just outside Calais. 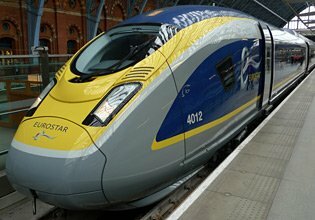 Check train times at www.eurostar.com or download the current Eurostar timetable in .pdf format here. Eurostar runs from London St Pancras to Brussels Midi every couple of hours. Most Brussels-bound Eurostars call at Lille in northern France, the interchange for French TGV high-speed trains to destinations all over France, see the London to France page. Some Eurostar trains stop to pick up passengers at Ebbsfleet International near the M25 & one or two call at Ashford International in Kent. A few Eurostars also call at Calais Fréthun, just outside Calais. 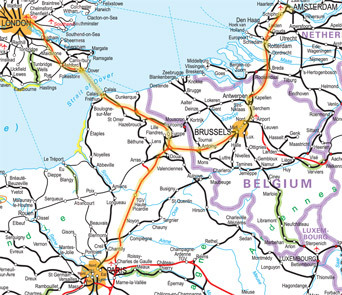 London to Brussels is 373 km or 232 miles, typical journey time 2h01, fastest journey 1h48. London to Lille is 266.5 km or 165 miles. In April 2018 Eurostar started a new service from London St Pancras via Brussels to Rotterdam & Amsterdam Centraal, initially twice a day on weekdays, once on Saturday mornings, and once on Sunday afternoons. In the inwards direction, it initially requires a change of train in Brussels until the Dutch government formally agrees to border formalities being carried out in in Amsterdam & Rotterdam. Check train times on the London to Amsterdam by Eurostar page. Eurostar runs a direct train from London to Lyon, Avignon & Marseille between one and five times a week in May-September, see the Eurostar to Lyon, Avignon & Marseille page. Eurostar runs a weekly winter ski train from London to Bourg St Maurice in the French Alps twice a week in the winter ski season, see the ski by train page. Eurostar also runs a direct train from London to Marne la Vallée, the station right outside the main entrance to Disneyland Paris, It runs several times a week all year round, daily in school holidays, for details click here. 90%-95% of Eurostar trains arrive on time or within 15 minutes, whilst competing short-haul flights typically manage only 65-70% measured by the same standard. From central London to central Paris, Eurostar is faster than flying, as well as more comfortable and convenient. Not surprisingly, Eurostar has now captured over 70% of the London-Paris market from the airlines. 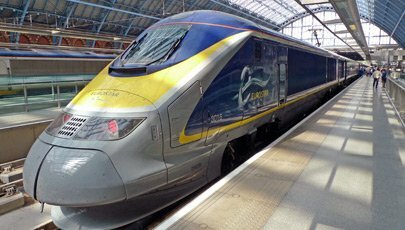 Eurostar has commissioned independent research estimating that a Eurostar train from London to Paris emits 11Kg of CO2 per passenger, over 90% less than the 122Kg per passenger emitted by a London to Paris flight. In addition, planes emit the CO2 directly into the upper atmosphere, where it is thought to do around 2.7 times the damage of the same CO2 emitted at ground level. Another good reason for treating yourself to a train journey! See www.eurostar.com/uk-en/about-eurostar/community-environment/treadlightly for more information. Red = high-speed lines. Highlighted = Eurostar route. Black = conventional lines. Green = scenic routes. I recommend buying a copy of the European Rail Map for your travels, www.europeanrailtimetable.eu with shipping worldwide. 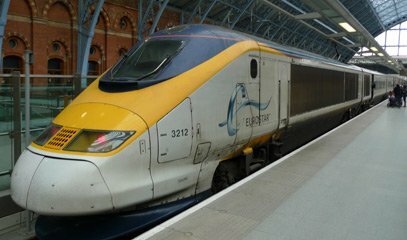 Eurostar fares from London to Paris or Brussels start at £44 one-way or £58 return in 2nd class, if you book in advance. Standard Premier (1st class) fares start at £112 one-way, £168 return. Booking usually opens 180 days ahead. But if you are going beyond Paris or Brussels, I strongly recommend waiting until onward bookings open (typically 92 or sometimes 120 days ahead) & confirm onward train times before committing to a non-refundable Eurostar ticket. 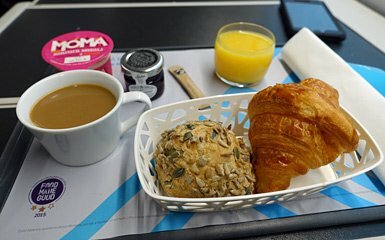 How do Eurostar fares work? 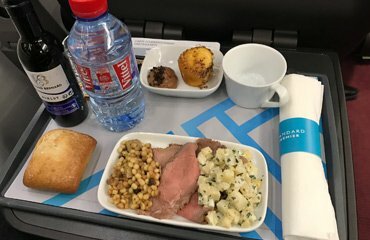 Eurostar has dynamic pricing like airlines. Prices increase as departure date approaches and the cheaper seats sell out, so book early. For example, standard class starts at £44 booked several months ahead but rises up to £191 if you buy on the day. Popular dates, days & trains will have higher fares (or fewer cheap tickets available) than less popular dates, days or trains. 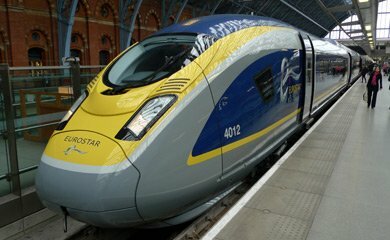 How to find the cheapest Eurostar tickets: You can check fares & train times at www.eurostar.com. For the cheapest fares, book well in advance - usually a maximum of 180 days ahead - and avoid busy Friday or Sunday afternoon trains when there are fewer cheap seats. In fact, Eurostar have now said explicitly that the cheapest £58 return fares will only be found between midday Monday & midnight Thursday, and between midday and midnight on Saturday. At all other times the cheapest return fare will be £78. One-ways start at £44 any day of the week. Tip for one-way travel: I've seen Eurostar round trip fares a few pounds cheaper than a one-way for a given date & train. So if booking one-way, just have a look at what it would cost for a round trip coming back as far ahead as possible, on the cheapest return train. You might save a few pounds! Refunds & changes to travel plans... All Standard & Standard Premier fares are non-refundable, but can be changed to another date & train for a £30 fee plus the difference in fare. In the fares chart below, fares shown with a from in front vary like air fares, rising as departure date approaches, with limited availability at each price level. The fares shown without a 'from' do not increase like this, and are what you'll pay as long as there are seats left - except for railpass holder fares which are limited by a quota. 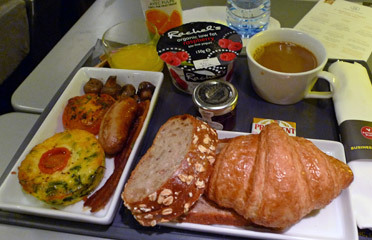 Like airline tickets, Eurostar can be expensive if not booked well in advance. If heading to Belgium, the Netherlands, Switzerland, Italy, Germany and so on, it may be cheaper to use the the Dutch Flyer from London to Hoek van Holland plus onward train tickets as this is often very affordable even booked just 24 hours before departure. Eurostar sometimes offer cheap 'Snap' tickets from £25 at short notice, although it has to be more than a week in advance, see the Eurostar Snap information below. Until 2009, a one-way ticket from London to Paris or Brussels actually cost more than a return! Fortunately, in June 2009 Eurostar introduced sensible one-way fares which were always cheaper than the equivalent return, although two one-ways still cost more than a return. In November 2014 Eurostar cut the price of its one-way fares so that a one-way ticket cost half the price of a round trip ticket. Unfortunately, they raised the one-way again in April 2015, so it's slightly cheaper to book a round trip rather than two one-ways. There are no fares for open jaw returns, for example going from London to Paris outward but Brussels to London on the way back, so just buy one-way tickets, for example London to Paris and Brussels to London. Unlike airlines, children under 4 go free on Eurostar, no ticket is required, just bring them along with their passports. A special child fare applies to children from 4 to 11 inclusive. Children 12 & over travel at the youth fare. All children under 12 must travel accompanied by an adult, and unaccompanied children from 12 to 16 require a consent form signed by their parent or guardian. See www.eurostar.com for more details. InterRail & Eurail passholders on Eurostar - new! You can now use an InterRail or Eurail pass on Eurostar on payment of a passholder fare, for details see here. Eurostar bookings normally open 180 days (6 months) before departure at www.eurostar.com. If you're just using Eurostar, not onward trains elsewhere in Europe, the easiest & cheapest way to buy Eurostar tickets is online direct with Eurostar at www.eurostar.com. You print your own tickets, or you can show them on your smartphone using the Eurostar app, or you can pick up tickets from the ticket machines at the station. 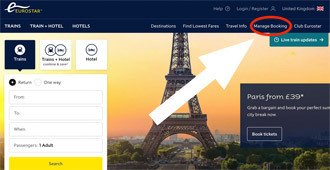 After paying, you can return to the www.eurostar.com home page, click on Manage my booking at the top of the page and use your booking reference and surname to find your booking and if desired, change your allocated seats. 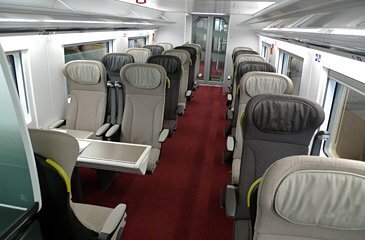 Tips on choosing a specific seat on Eurostar. To buy a passholder fare with an InterRail or Eurail pass, see here. Eurostar's UK telesales office is open 08:00-19:00 on Mondays-Fridays and 09:00-17:00 weekends & holidays. Print-at-home tickets can be sent to you by email or you can pick up tickets at the station before departure from the e-ticket machines. There's a £10 phone booking fee, although no fee is charged to those buying Business Premier tickets. If you are taking onward trains beyond Paris or Brussels, for example from London to Spain, Italy or the south of France, it's best to book Eurostar and your onward train tickets together at the same time as explained on the relevant page of this website. Although Eurostar bookings usually open 180 days before departure, reservations for most other European trains only open 90, 92 or sometimes 120 days ahead. I strongly recommend waiting until onward bookings open so you can confirm onward train times before committing to a non-refundable Eurostar ticket. Timings for onward trains can change on specific dates because of engineering work. See the Train travel to Europe page for more information about how to buy European train tickets. How to change trains & stations in Paris by metro or taxi. Advice on changing trains in Brussels. 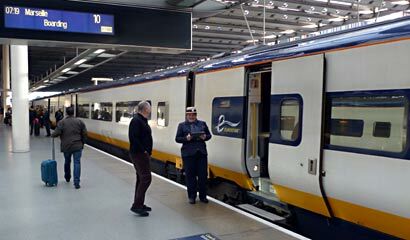 Option 1, buy a Eurostar through ticket: www.eurostar.com sells through tickets from over 100 UK towns & cities to Paris or Brussels, as long as you book 3 months or less before travel, after UK train booking has opened. Option 2, use www.loco2.com. This site can book through from any rail station in Britain to Paris, Brussels and destinations all over Europe. It does this by adding a special ticket to London International CIV as described below, to a Eurostar ticket and onward European tickets. This usually costs a bit more than option 1. Option 3, you can buy a separate UK train ticket to London. There are special fares from most stations in Britain to a destination called 'London International CIV' designed to be used with Eurostar tickets, which you can buy online following the instructions here. Stations can sell these tickets, though staff aren't always familiar with them. These fares have few or no time restrictions, so you can travel in the Monday-Friday peaks at an affordable fare, they also ensure that international conditions of carriage (the CIV) apply to your whole journey, so if the UK train is late & you miss your Eurostar or vice versa you'll be rebooked on a later train at no charge. 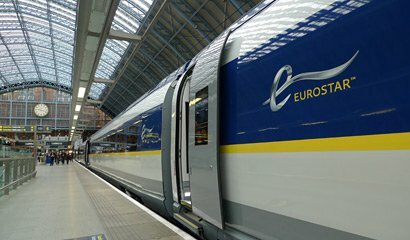 Full details & advice for buying UK train tickets to connect with Eurostar. Eurostar fares normally work like air fares, starting at £44 if bought in advance rising to £191 if bought on departure day. However, Eurostar have decided to offer a budget option for short-notice travel if you don't mind only being told exactly which train you'll be on within 48 hours of departure. These snap fares are only sold on a special mini-site, https://snap.eurostar.com. They're intended to fill spare capacity now most of their new 900-seat e320 trains are in service. Snap fares launched in May 2016. - Go to https://snap.eurostar.com, you must sign up using Facebook or Twitter. - Booking opens as much as 30 days in advance but closes 7 days before departure. - You specify a date and specify morning or afternoon. The site shows which dates are available. - The exact choice of train is left up to Eurostar, you'll get an email confirming the train 48h before travel. - Just remember morning could mean the first 05:40 departure from London, afternoon the last train at night! - Only available between London and Paris or Brussels, not intermediate stations. - Only for travellers over 16, not children. - No refunds, no changes. - You can't buy Eurostar Snap tickets at www.eurostar.com site - just use it to check how much you saved! Special fare for InterRail & Eurail passholders - New! InterRail (for European residents) & Eurail (for overseas visitors) are the two major railpass ranges giving unlimited travel on Europe's railways. Eurostar became a full member of the InterRail & Eurail schemes in January 2017. InterRail & Eurail passes now allow you to use Eurostar's core routes between London/Ebbsfleet/Ashford & Paris/Brussels/Calais/Lille/Disneyland if you pay a special passholder fare. The London-Amsterdam route is also now covered. However, the direct Eurostars between London & Lyon/Avignon/Marseille and the ski trains between London & the French Alps are not covered. You qualify for a Eurostar passholder fare if you have an InterRail or Eurail global pass. You don't qualify if you only have an InterRail or Eurail one-country pass. The passholder fare is €30 in standard class or €38 in standard premier. The price is the same for adults, seniors, youths or children. Whatever anyone may tell you, you can only book standard premier if you have a 1st class pass. Passholder places are controlled by a quota but you'll find plenty of availability if you book in advance and (I'm told) you should find reasonable availability even on the day of travel. Just remember that the passholder quota may be set to zero for the busiest trains, for example on Friday & Sunday afternoons & evenings or around major holidays. Like regular tickets, passholder fares are non-refundable, but they can be changed to another date or train for the standard £30 change fee. If you have a flexi-type pass, yes, using a Eurostar passholder fare requires you to use one of your unlimited travel days, but of course you can use other trains that day as well as the Eurostar, before or after the Eurostar journey. Check-in 45 minutes before your train, not 30... Passholder print-at-home tickets may not operate the check-in gates so you must check-in at one of the staffed kiosks so your pass can be checked. Passholders are therefore asked to check in at least 45 minutes before their train, instead of the usual 30. This may have changed, feedback would be appreciated, but it was certainly the case at launch. 1. Go to www.b-europe.com, hover over Plan & book then click InterRail train passes. 2. Then scroll down to THALYS AND EUROSTAR PASS FARE and click Book your Thalys or Eurostar pass fare now. 3. Then use the journey planner to book your train. You should see the €30 or €38 passholder fares. 4. You are emailed your Eurostar ticket to print or you can show it on your smartphone using the B-Europe app. Anyone from any country can book this way, either with a Eurail pass or an InterRail pass, even though www.b-europe.com only refers to InterRail. Eurostar passholder tickets are exactly the same for either InterRail or Eurail, it makes no difference, so just go ahead and book whichever type of pass you have. Just remember that you can only choose standard premier (1st class) on Eurostar if you have a 1st class pass. Option 2: Anyone from any country can make Eurostar (and Thalys & Trenitalia) passholder bookings for InterRail or Eurail in the Railplanner App once installed on your smartphone - I recommend this app for its usefulness for offline timetable enquiries in any case. Download the app at eurailgroup.org/travellers-area/#railplanner. 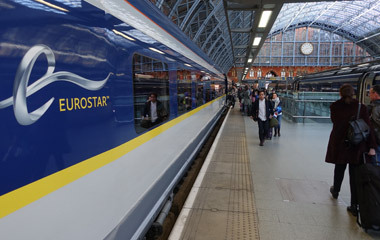 Option 4: Eurostar passholder fares are also available directly from the Eurostar ticket offices in London, Ebbsfleet, Calais, Lille, Paris & Brussels, or by phone from Eurostar telesales on 03432 186 186 (UK) or +44 1233 617575 (overseas) but there may be a phone booking fee. A WORD OF ADVICE: This new passholder regime is still fairly new, I'm finding that many staff don't know about it. If you are told the passholder fare is £82, politely ask them to check for details of the new €30 passholder fare with their supervisor. And remember, you can only buy a standard premier Eurostar ticket if you have a 1st class pass. 2nd class pass = standard class Eurostar. Also known as 2nd class, standard class is comfortable, carpeted and air-conditioned, and all seats have an individual reading light and fixed or drop-down table. 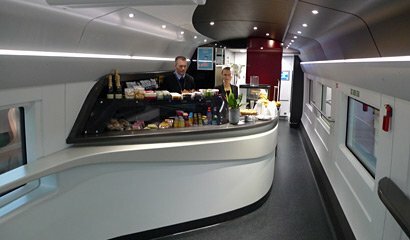 You'll have access to the two cafe-bar cars, or you can bring their own food & drink on board. Only cars 5 & 14 have power sockets on classic Eurostars, but all seats have power sockets on the new e320 and refurbished e300 trains. There is free WiFi on e300 and e320 trains, but no WiFi on the classic trains. Standard class seats on the classic trains don't recline, those on the new e320 and refurbished e300 trains can be reclined slightly. Standard class seating on a new e320. e300 trains are similar. Standard Premier offers first class seating with fares aimed at upmarket leisure travellers & budget-conscious business travellers. As in Standard class, there's a 30-minute minimum check-in and no access to the business lounge, tickets are all non-refundable and only changeable for a fee. A complimentary cold light meal and a round of alcoholic & non-alcoholic drinks are served at your seat. 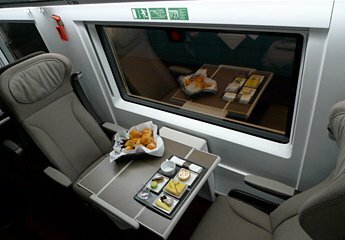 There are power sockets at all 1st class seats on all types of Eurostar, and free WiFi on the new e320 and refurbished e300 trains. All seats adjust from upright to a slight recline and all seats have an individual reading light and fixed or drop-down table. Although confusingly using the word 'Standard' in its brand name to help attract business travellers whose companies don't officially allow first class travel, make no mistake, this is indeed first class. Standard Premier replaced Leisure Select in September 2010. Is Standard Premier worth the extra? Standard class is perfectly adequate and it's only 2 hour 20 minutes to Paris or 2 hours to Brussels after all. There's no need to pay more if you don't want to. But compared to standard class, Standard Premier gives you wider seats with more leg & elbow room, the chance to choose solo seats or face-to-face tables for two, it's usually quieter with fewer families & kids, and of course there's the included light meal with wine, beer, tea, coffee & soft drinks. So yes, it's a nice experience especially if your journey is for a special occasion! See what the price difference is for your dates, as I've seen Standard Premier cost only £10 more than Standard, given Eurostar's dynamic pricing. Standard Premier seating on an e320 or e300 train. Business Premier uses exactly the same 1st class seating as Standard Premier, but in designated coaches and with fully-flexible & fully-refundable tickets, access to Eurostar's Business Lounges in London, Ebbsfleet, Paris & Brussels and a 10 minute minimum check-in. 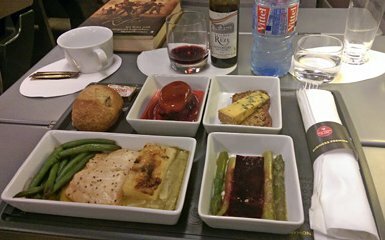 The fare includes a complimentary hot airline-style meal, champagne (a particularly nice Monopol brut), wine, beer & soft drinks served at your seat. There are power sockets at all 1st class seats on all Eurostars, and free WiFi on the new e320 and refurbished e300 trains. All seats adjust from upright to a slight recline, and all seats have an individual reading light and fixed or drop-down table. The only downside? It's priced assuming your company is paying! Business Premier seating on an e320 or e300 train. Standard Premier and Business Premier passengers are accommodated in separate first class carriages but the seating is identical, with a spacious seating arranged 2+1 (2 seats, aisle, 1 seat) across the width of the train. Eurostar vary the allocation of first class cars on each train between these two classes according to demand. 1st class seats have extra legroom compared to the higher-density seating in Standard class which has a 2+2 (2 seats, aisle, 2 seats) configuration. 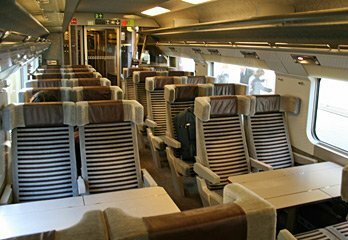 See the Tips for choosing your seat section below for a Eurostar seating plan. 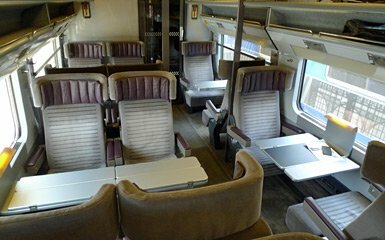 All Eurostar tickets include a specific reserved seat, and initially you'll be allocated seats. If you're buying at www.eurostar.com, after you pay you get an opportunity to change these allocated seats by selecting specific seats from a numbered seating plan. If you have already bought tickets, either at www.eurostar.com or another website, you can go to www.eurostar.com and click the Manage my booking link at the top. Enter your booking reference & surname and assuming you have a compatible booking reference* it will let you change your seats by selecting specific seats from a numbered seat plan. See tips on picking the best seats below. * The type of reference you have depends on how you booked the Eurostar, as not all Eurostar booking references work the manage my booking system. It will work if you bought your ticket at www.eurostar.com or from a direct Eurostar agent. But booking references issued by some other agencies such as loco2.com, bahn.de, b-europe.com or raileurope.com may not work this system as they book Eurostar via the French Railways ticketing system, not directly through Eurostar's own system. By all means try, but don't be upset or worried if your reference number doesn't let you use this feature on the Eurostar site. How to tell which type of Eurostar operates which departure: e320, e300 or classic? Go to www.trainline.eu, run an enquiry & find your train in the search results. Click on a first class fare and make a dummy booking, taking it to the point where it shows your car & seat number, just before you have to pay. If your first class seat is in cars 1, 2, 3 or 14, 15, 16 it is an e320. If it is in cars 7, 8, 9, 10, 11 or 12 it is either a classic or e300. Remember that the type can still be switched on the day for operational reasons! www.trainline.eu used to show on the search results page which type it was, but seems to have now stopped doing this. 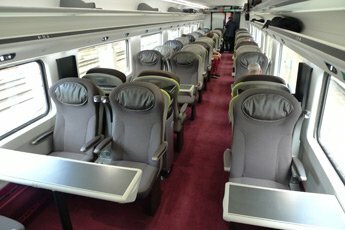 If you already have a ticket you can go to www.eurostar.com, click Manage my booking then use the Change your seats feature to see a seat plan for your train, assuming the Manage my booking feature works with your booking reference. If your train has 16 cars with 1st class at each end, it's due to be an e320. If 18 cars with all 1st class cars in the middle, it's an e300 or classic. In a nutshell, you can't, as the refurbished e300 & classic Eurostars are used interchangeably. 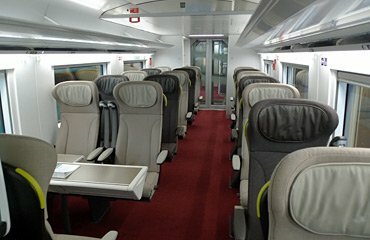 Eurostar.com always shows the seat plan for a refurbished e300, even if it might be a classic train. 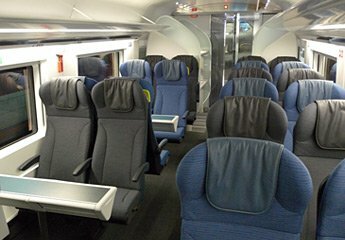 8 of the original 1994 Eurostar trains are being refurbished with a completely new interior and designated e300. The first e300 entered service in September 2015, and by the end of 2018 all classic Eurostars should have been withdrawn. If your train has 18 cars, it's either a classic Eurostar or an e300. 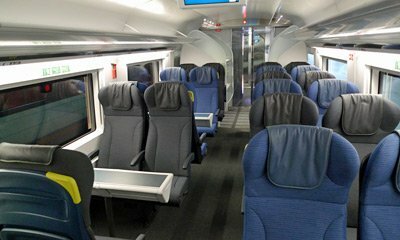 The seating layout is slightly different on an e300, for example seats 61 & 65 in 1st class cars 7, 8, 11 or 12 are face-to-back solo seats on an e300, not face-to-face table-for-two as on an original train. Eurostar's online seat selection graphic may show incorrect window positions. Eurostar revamped their website in 2013, and when you click to choose your exact seat when managing you booking, the graphic seat numbering plan shows the windows in an incorrect position relative to the seats. The detailed PDF format seating plan here for a classic train, here for a refurbished e300 or here for an all-new e320 is accurate and car 1 is always at the London end of the train, car 16 or 18 at the Paris/Brussels end, so if window location or facing forwards is important to you, choose your seat numbers carefully using the accurate plans, taking the window locations shown in the seat selection graphic on eurostar.com with a big pinch of salt. If you want a power socket for a mobile or laptop, choose cars 5 or 14 in standard class in a classic Eurostar. In first class, all cars have these. In the refurbished e300 & new e320 trains all seats in all classes have power sockets. If you have small children, book seats in cars 1 or 18 (standard class) in a classic Eurostar as these are near the baby-changing room, and are at each end of the train so have less people walking through them to the bar. These cars have lots of bays of 4 seats (with or without a table, your choice), which are much better for families than face-to-back airline-style seating. In the e300 & e320 trains most toilets in all cars have baby-changing tables. If you're travelling as a group of 3 or 4 people, choose seats around a table as opposed to airline-style pairs all facing the same way, as this is much more sociable. If you're a couple in first class, choose a pair of seats facing across an intimate table-for-two, as in the first class seats picture on the right. 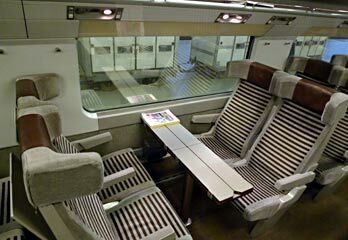 Seat 61 is one of a pair like this on the classic Eurostar trains, and in most 1st class cars on the new e320 trains. If you want seats facing forward, this can be seen on these accurate seating plans (look closely at the train diagram, it shows which way the train goes when heading to Paris/Brussels, and when heading to London. If you prefer a window seat which lines up with the window (rather than one next to a blank bit of wall between the windows), look carefully at the plan. The white or pale blue sections in the coach walls on the plan are the windows. In standard class, a seat in the car next to the bar car makes it easier to fetch food and drink, which might be a consideration. On the other hand, you get more people walking through to get to the bar. 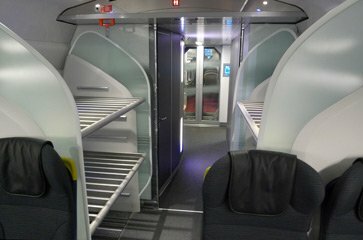 If you've a tight onward connection when your Eurostar arrives in Paris or London, book a seat at the front of the Eurostar train (i.e. cars 16 or 18 southbound to Paris, or cars 1 or 2 northbound to London), as you'll get off the platform ahead of everyone else and with less of a walk, saving vital minutes. If going to Brussels, see information about the short cut to other platforms here. Quiet coach: Eurostar trialled a 'quiet coach' in Business Premier and Standard Premier (but not Standard class) in 2012, but the trial ended, and there is now no designated quiet coach. Eurostar telesales: 03432 186 186 (08:00-19:00 Mon-Fri, 09:00-17:00 weekends, from overseas call +44 1233 617575). £10 fee for phone bookings, except for business premier tickets for which there's no fee. Bikes & registered baggage service: 0844 822 5822 (from outside the UK call +44 207843 7554). 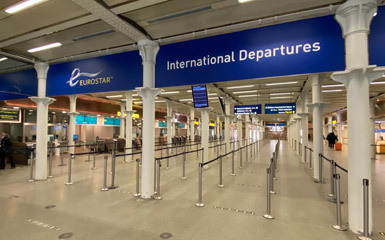 Unlike other British and European trains, Eurostar operates a check-in system. You must check in for any Eurostar train at least 30 minutes before departure (10 minutes for Business Premier passengers, 60 minutes for the Eurostar ski trains). 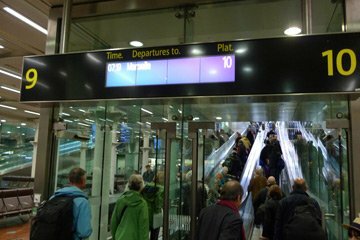 Check-in opens at least 1 hour and up to 2 hours before each train departure - it varies depending how busy they expect to be that day. To check in, place your ticket barcode against the small scanner screen on the automatic ticket gates at the entrance to the departure lounge. Or you can use a staffed check-in desk, so if you want to change your allocated seat (for example, to make sure you're facing forward), or you have a Sparpreis London ticket to Germany which won't work the automatic gates, use a staffed desk. After the check-in gates comes an airline-style security check with X-ray for your bags & metal detector for you, but this is quicker & easier than at an airport. No nonsense with liquids (though they don't like you carrying a cup of coffee through! ), no need to remove your belt or shoes, just put your bags & coat through the X-ray scanner, remove metal items such as keys & coins and walk through the metal detector. After the security scan (or before it, in Paris, Lille & Brussels) there's a UK and French passport check. 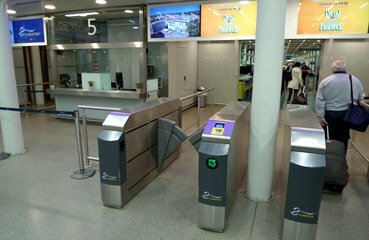 In London and Paris you can now choose to use a normal staffed passport kiosk or the new e-passport automated gates. 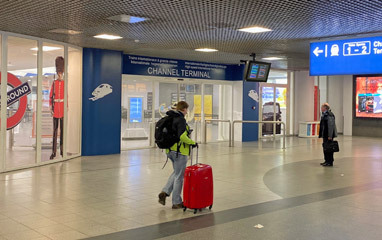 Then you're inside the departure lounge and free to use the shops, bar, cafe or other facilities until your train is ready for boarding, usually 15-20 minutes before departure. The check-in gates are in the wide passageway off the lower (street) level shopping arcade, one level down from the Eurostar trains themselves. 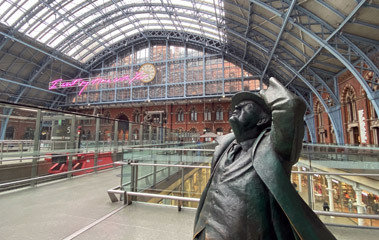 For more info about St Pancras station & its facilities, where to have a meal and so on, see the St Pancras station guide. Once inside the Eurostar departure lounge at St Pancras, there is a Café Nero, a bar, W H Smiths newsagents & travel goods shop, toilets and a Eurostar information desk. The Eurostar information desk can provide you with Eurostar information, a free map of Paris, and Paris visitor metro passes. 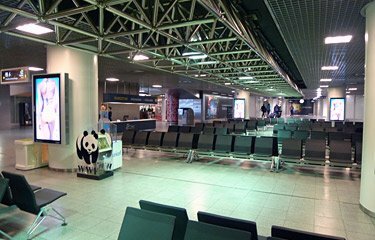 The Paris & Brussels departure areas have similar facilities. 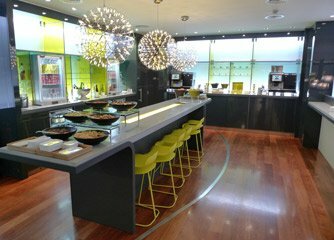 If you have a Business Premier ticket (or Eurostar Carte Blanche card or American Express Platinum Charge Card) you can use the excellent Eurostar Business Lounge with comfortable armchairs, WiFi and complimentary tea, coffee, wine, beer, spirits, juice and snacks. There are Business Lounges at London St Pancras, Ebbsfleet, Paris Nord & Brussels Midi although not at Ashford, Calais or Lille. The entrance to the Business Lounge at St Pancras is on the platform 10 side of the regular departures lounge, roughly level with the passport control kiosks. 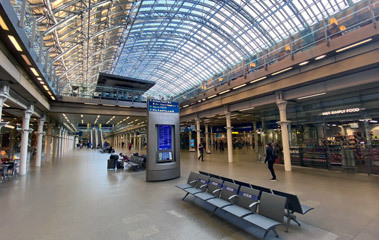 The six Eurostar platforms at St Pancras (platforms 5-10) are directly above the departure lounge, and a boarding announcement will be made about 15-20 minutes before departure. There are two gently-sloping moving walkways up to each platform, plus a lift. If your reservation is in cars 1-5, you use one walkway, if your reservation is in cars 6-18 you use the other. Just follow the signs! St Pancras' beautiful gothic facade... The station building is now a luxury hotel, the Renaissance, accessed from the forecourt via the big archway in the photo above. See London St Pancras station information. Upper level: Champagne bar, statues, upmarket bars & restaurants, track & trains. You scan your ticket barcode to open the automatic gates, then through security, then a passport check, and you're in the departure lounge! Departure lounge... The Eurostar main departure lounge, with seats, mobile recharging bar, info desk, cafe, shop, toilets & bar. In this photo you can see the travelator up to the platform, and the shop at the back. The blue bench seating in the centre of this photo has now been improved with more regular seating of the brown type. Business Premier lounge... If you've a Business Premier ticket (or Amex Platinum card) you can use the Business Lounge with complimentary wine, spirits, beer, tea, coffee & soft drinks. Boarding... When boarding is announced, staff open the glass doors and passengers go up the travelators to the platform above. There are six platforms, 5-10. 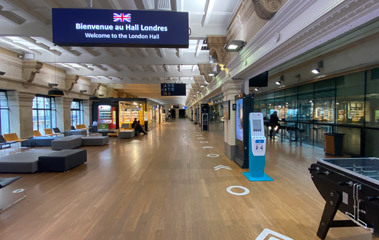 To reach the Eurostar check-in gates you must go up to the first-floor balcony overlooking the main concourse using the escalator opposite platform 17, then walk along the balcony to the Eurostar check-in gates which are at the platform 3 end. Once past the ticket gates there are French then British passport checks, then the security scan. You then enter the departure lounge which is on the first floor alongside platform 3 (there isn't a platform 1 or 2 at Paris Nord). It has seats, toilets, shops & cafes. If you have a Business Premier ticket (or Eurostar Carte Blanche card or American Express Platinum Charge Card) you can use the Business Lounge with complimentary wines & spirits, soft drinks, tea coffee & snacks, and free WiFi. It also has a cocktail bar, open afternoon and evenings. It's on the second floor, up the stairs or lift immediately after the security checks. Eurostar trains leave from Paris Nord platforms 3, 4, 5 & 6. When boarding is announced 15-20 minutes before departure, you follow everyone else directly out of the terminal onto a short footbridge and down the travelator onto the platform. 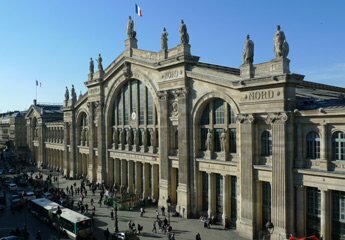 See more information about Paris Gare du Nord including station layout, places to eat & drink or buy food. This photo is taken from ground level with my back to the trains and the main exit to the street in front of me, hidden behind the information kiosk. It shows the balcony accessed from escalators opposite platform 17, leading to the Eurostar terminal. Eurostar departure lounge at Paris Nord. There are toilets, shops and cafes. Business Premier lounge at Paris Nord, upstairs. It features this great cocktail bar. The main concourse at Brussels Midi is a wide and (it has to be said) gloomy street-level passageway running underneath all 22 platforms. Eurostar trains leave from platforms 1 & 2, and the Eurostar terminal opens off this concourse at the platform 1 end. It's marked Channel Terminal. Inside the Channel Terminal doors you'll find a small waiting area with the Eurostar ticket gates, then passport checks (Belgian followed by British) then the X-ray & metal detector security scans. Once in the large departure lounge there is a car-bar, jewellers and chocolate shop. 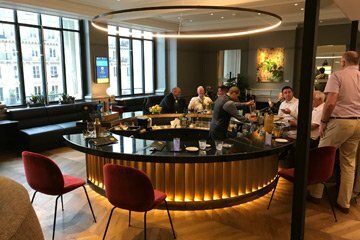 If you have a Business Premier ticket (or Eurostar Carte Blanche card or American Express Platinum Charge Card) you can use the Business Lounge with complimentary wines & spirits, soft drinks, tea coffee and snacks. 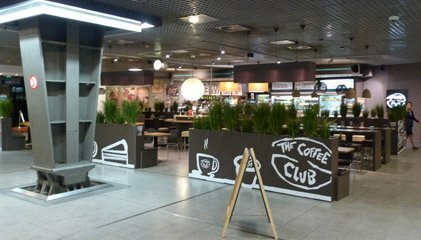 The entrance is inside the main departure lounge, veer left when you enter, passing the cafe counter to your right. See more information about Brussels Midi station including station layout, places to eat & drink or buy food. There's a cafe (pictured above), jewellers & chocolate shop. The entrance to the Business Premier Lounge is to the left of the cafe, behind the big steel pillar in this photo. Business Premier lounge. This is the drinks area. 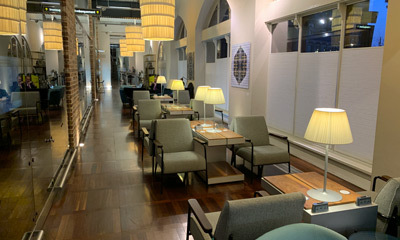 You can use the lounge with a Business premier ticket, Eurostar Carte Blanche card or Amex Platinum card. There are now three types of train in service with Eurostar. Eurostar's classic trains, dating from 1994 when Eurostar started. There are now just 2 left, they will disappear completely in 2019.
e300 trains are classic trains refurbished with a new interior like the e320. By mid-2019, Eurostar will have eight e300 trains. e320 trains are all-new trains built in 2015 by Siemens. By the end of 2018 Eurostar will have 17 e320 trains. How to tell which type of Eurostar is due to operate which departure. All of these original unrefurbished Eurostars were supposed to have been either withdrawn or rebuilt as one of eight e300 trains by the end of 2018, but one or two unrefurbished trains have survived in service into 2019. These are Eurostar's original class 373 trains, also known as TMST (Trans-Manche Super Train) introduced in 1994 when Eurostar started. 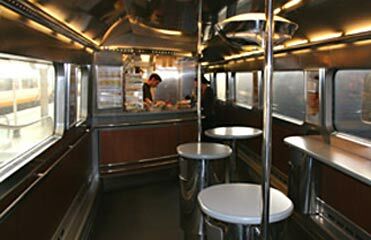 They were refurbished with an interior by designer Philippe Starck in 2004-2005. Standard (2nd) class seats are 2+2 across car width. 1st class seats used as Standard Premier & Business Premier are arranged 2+1 across car width, some unidirectional, some solo seats, some tables for 4, some tables for 2. Cafe-bar. 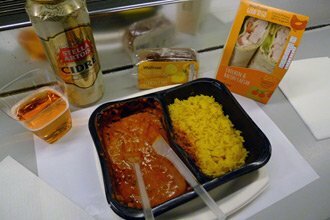 There are two bars on each train in cars 6 & 13, selling tea, coffee, wine, beer, snacks & hot dishes such as chicken tikka massala. Pounds, euros & cards accepted. Eight of the original classic Eurostar trains (TMST) are being refurbished and designated e300 - a reference to its 300km/h top speed. This is no mere change of the seat covers, it's a completely new interior, making them almost indistinguishable from Eurostar's brand-new e320 trains (the much larger cafe-bar area is one difference!). Like the new e320s, the refurbished e300 trains feature free WiFi in all classes, power sockets at all seats, and USB sockets as well as power sockets in 1st class. As at March 2018, four or five e300s are in service with the remaining sets due to be completed by the end of 2018 or sooner. Until the last of the unrefurbished classic trains is withdrawn, refurbished (e300) and the remaining unrefurbished (TMST) trains are being used interchangeably so there's no way to know if you'll get one or the other, it'll just be a nice surprise if it's an e300. They have 18 cars. The seat layout is similar to the original TMST but with a few slight differences. Notably seats 61 & 65 in cars 7, 8, 11 & 12 no longer face each other over a table, but are both solo seats, face to back. Click here for e320 seating plan. How to tell if your Eurostar is due to be an e320. How to tell if you're booked on an e320: If you run an enquiry on www.trainline.eu and select a fare for your train, look on the right at the details. It will say e320 next to the train number if the service is due to be operated by an e320. If it says e300, it's either an e300 or classic Eurostar. Standard class. Sockets & free WiFi at all seats. An e320 at St Pancras. All Eurostar trains are completely non-smoking. Business Premier includes an excellent complimentary hot airline-style 3-course meal with champagne & wine, with menus designed by master chef Raymond Blanc. Standard Premier includes a simple cold tray meal with complimentary red or white wine, beer or soft drinks, tea & coffee. All passengers have access to two bar cars, located in cars 6 & 13 on the classic trains & refurbished e300 trains and in cars 8 & 9 on the new e320 trains. The cafe-bars serve tea, coffee, hot chocolate, beer, wine, spirits, sandwiches, wraps and a few hot dishes such as Chicken Tikka Massala. The bar accepts credit cards as well as cash. You can eat and drink in the bar area (standing space only, there are no seats) or take food & drink back to your seat. Alternatively, feel free to take your own food and drink, even your own bottle of wine. You're unlikely to have any problem taking a bottle of wine in your bags (the overnight Ski Train is the exception). Eurostar cover themselves by stating that some or all alcohol may be confiscated if you have 'excessive' quantities on you, in practice there is unlikely to be any problem unless you are disorderly or shipping a whole off-licence. The bar car also sells Paris metro tickets, individually and in carnets of 10. They charge only slightly more than you'd pay at the metro station in Paris, so if you have to cross Paris to catch an onward train this is the best way to buy your metro ticket. On the new e320 trains and the refurbished e300 trains there are power sockets & USB ports at all seats in all classes, under the armrest. They are alternately of the UK-type 3-pin and European-type 2-pin, so your seat could have either type, but the seat next to you will have the other type. On the original trains, all cars in Business Premier & Standard Premier have power sockets, but in 2nd class only cars 5 & 14 have power sockets at seat, so make sure you book seats in car 5 or 14 if you need one unless you're sure your train is a new e320. The new e320 trains and the refurbished e300 trains have effective free WiFi in all classes. However, there is no WiFi on the unrefurbished original trains. On the WiFi-equipped trains you'll find a selection of TV & movies to stream for free at onboard.eurostar.com as well as journey information. 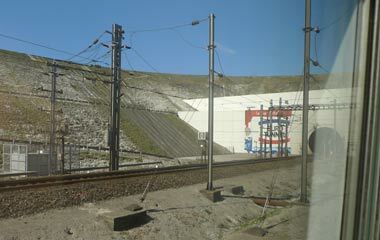 There is good mobile phone voice & data reception throughout almost all the Eurostar journey including inside the Channel Tunnel, where it's provided by French telecoms companies in the northbound (towards London) running tunnel and by British telecoms companies in the southbound (from London) running tunnel. There is free WiFi at St Pancras International station for everyone. WiFi access at Paris & Brussels is also available, but must be paid for. You bring your bags with you and put them on the luggage racks. Large racks near the entrance doors easily take large items. Anything up to back-pack sized will fit on the overhead racks above your seat. Unlike travelling by air, you don't check in your bags when travelling by train. You keep them with you, placing small or medium size bags (up to backpack-size) on the luggage racks above your head and larger items on the big suitcase racks at the end of the coach just inside the entrance doors. Labelling your bags: You must label your bags with your name (first name and surname), you'll find free paper labels at the terminal if you've forgotten. 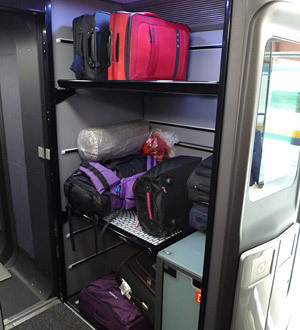 For information about luggage limits on Eurostar & other European trains, see the luggage on European trains page. Luggage limits on Eurostar: In principle at least, Eurostar limits luggage to 2 large items per passenger, maximum 85cm in any one dimension, plus a small item of hand luggage. There's no weight limit, so you can pretty much pack what you like, and (again unlike anally-retentive airports and airlines) nobody actually measures your bags or even worries if you have an extra carrier bag or two, as long as they all fit through the X-ray machines and don't cause any problems. Items over 85cm: In theory there's a maximum size limit of 85cm in any one dimension. Which is odd, as there's no such limit on any other British or French train, and there's no real logic to it as far as I can see, as long as items fit through the X-ray scanners at check-in. If you call Eurostar, staff may repeat the official 85cm limit and say you should use Eurostar's baggage service, but this is useless for anyone continuing beyond Paris, Brussels or London as items are only be available for collection with 24 hours of your Eurostar's arrival. But in reality nobody measures your bags at check-in, and in practice people take guitars, 1 metre long tubes with rolled-up plans or posters inside, and other items that are a little over 85cm onto Eurostar, as they do on any train. I can't 101% guarantee you'll never meet a jobsworth at check-in of course, but in 15 years of running this site I yet to hear of anyone having any problem. In practice Eurostar is generally relaxed as long as you don't take the P.
Guitars & other musical instruments: Eurostar's policy on taking musical instruments is at www.eurostar.com/uk-en/travel-information/travel-preparation/baggage/baggage-allowances. Basically, if it's under 85cm long, no problem, but over that and you pay a child rate for a seat next to you. Though in practice nobody measures things so you will probably get away with taking a 90cm guitar as regular luggage and simply putting on a rack above your seat. I can understand the official policy with a cello or double bass, but it does seem a nonsense that you have to pay for a guitar when it's perfectly normal to take a guitar free of charge on any other UK or European train. See the paragraph above about items over 85cm in practice as well as theory. Prohibited items that can catch you out: As well as the obvious prohibited items such as firearms or explosives, Eurostar prohibits any knife with a blade over 3", which has been known to catch out people returning to London with a nice set of Sabatier kitchen knives they bought in Paris. Eurostar offer a checked baggage service for extra large items, which costs extra, see the baggage information page at www.eurostar.com. No alcohol is allowed on the overnight Eurostar Ski Train to the French Alps, and only limited alcohol (no spirits) is allowed on the daytime Ski Train, but it's usually fine (within reason) on normal Eurostars. Ice axes: Until 2013 ice axes were not officially allowed on Eurostar. Eurostar then changed their policy in 2013 and ice axes were officially allowed, if suitably tucked away in your luggage. Now in 2018 we're back to them not allowed again. London St Pancras has a left luggage office run by the Excess Baggage Company. Opening hours & prices. Paris Gare du Nord has left luggage lockers (consigne in French) downstairs under the main concourse just off the end of the Eurostar platforms and to the right. Opening hours & prices. Bicycles can be taken on Eurostar trains in the luggage van for a fee, pre-booked with their luggage people, see the Taking your bike by train page for information about taking bikes on Eurostar and other European trains. Unfortunately, you cannot take dogs or other pets on Eurostar trains, except for guide dogs. Eurostar can provide assistance to passengers with special needs travelling from London to Paris, Lille or Brussels. 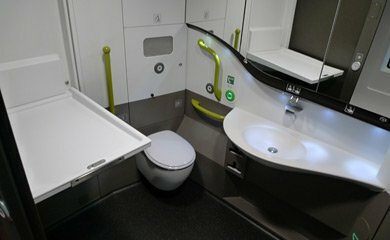 If you are confined to a wheelchair, there are wheelchair spaces and wheelchair-friendly toilets on each Eurostar train. There are also special fares for people travelling in wheelchairs and a travelling companion. Electric-powered scooters can also be carried, subject to some maximum dimensions, in the baggage area on each train. 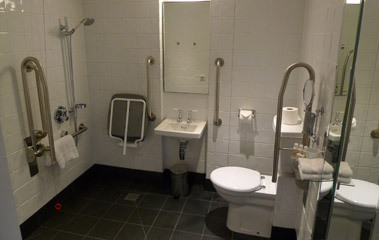 For more information about travel with disabilities specifically on Eurostar, see www.eurostar.com. For more information about travelling by train throughout Europe if you have a disability, see the Travelling with Disabilities page. 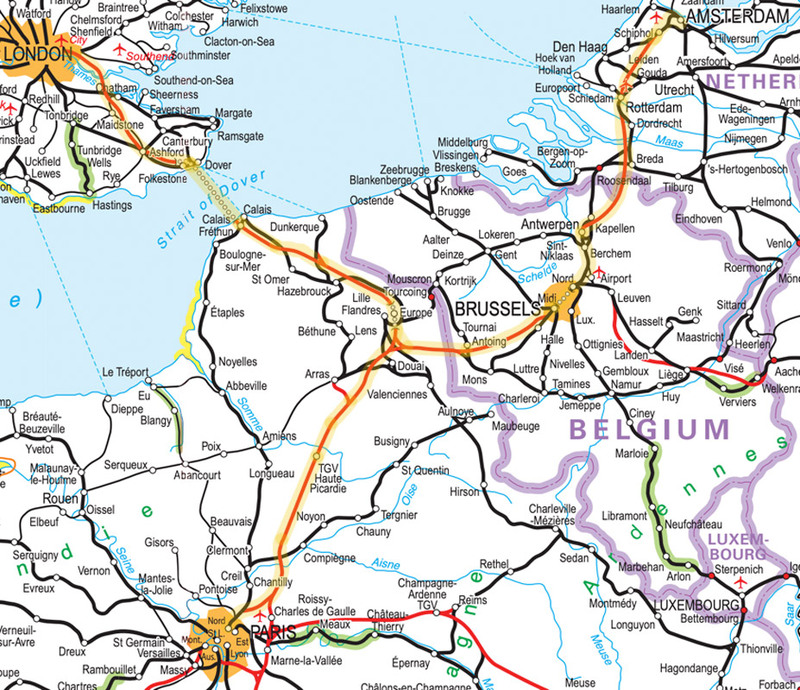 This section describes a journey from London to Paris, but the journey from London to Brussels is identical until just after Lille, where the train leaves the Paris route and enters Belgium for the last half hour or so. The train manager makes his announcement that your Eurostar train to Paris is about to leave, the door alarm sounds and the doors then hiss shut. As you settle into your seat, the brakes hiss off and the Eurostar very gently eases itself out of the magnificent arched trainshed of St Pancras International Station. At this stage, the train is heading north, but almost immediately it makes a sharp right-hand turn past the huge steel gasometers that have been a familiar sight behind Kings Cross/St Pancras for years and which are now, believe it or not, listed structures. Within a minute or two the Eurostar enters a covered bridge across the tracks leading out of the adjacent Kings Cross station, which becomes a long tunnel under east London taking the Eurostar east and south. About 5 minutes after leaving St Pancras, you'll see a glimpse of daylight and the platforms of Stratford International station, only served by the domestic high-speed trains. Around 8 minutes after leaving St Pancras, the Eurostar train emerges from the tunnel and starts crossing the wastelands of east London, past warehouses and run-down housing estates. Just 10-12 minutes from St Pancras you'll see the impressive Queen Elizabeth II suspension bridge on the right, which carries the M25 London orbital motorway across the River Thames at the Dartford Crossing. The Eurostar now plunges back into a short tunnel for its own crossing underneath the Thames, emerging the other side in the county of Kent. Some Eurostar trains now call at Ebbsfleet station in north Kent, near the M25 motorway. The Eurostar train is now running at its full service speed of 186mph (300 km/h), with traffic on the adjacent London-Dover M2 motorway almost standing still in comparison. 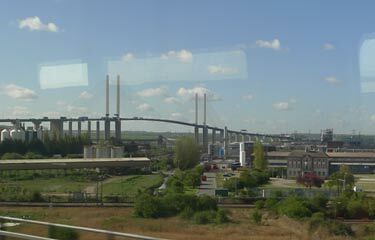 Just 15-20 minutes after leaving London, the train crosses the most dramatic structure on the new high-speed line, the viaduct high over the River Medway. To the right of the train as it crosses the viaduct, you'll see small boats moored on the muddy riverbanks far below you. To the left of the train, over the top of the adjacent M2 motorway bridge, you can see Rochester Cathedral and Rochester Castle in the distance. Now at last you're in green and pleasant rural Kent, with villages nestling at the foot of the chalky hills to the left. A few Eurostars still call at Ashford International station, a major railway junction in east Kent, but most Eurostars now 'fly' over the town on a huge flyover, with the station way below you, the town centre to the left and the old Southern Railway Ashford works to your right. Just 35 minutes from St Pancras, the fields and hedgerows of east Kent give way to the roadways and check-in lanes of the Folkestone Eurotunnel terminal. This is where cars and lorries are put on the Eurotunnel car-carrying shuttle trains to go through the tunnel to France. Your Eurostar train passes through the middle of the terminal non-stop, and the train manager announces that you are about to enter the Channel Tunnel. 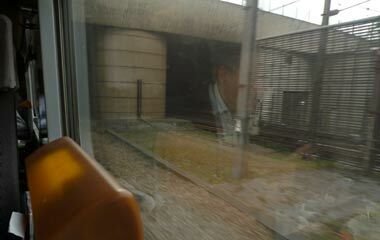 Passing through the Channel Tunnel takes just 20 minutes, and is something of an anti-climax. The Channel Tunnel (sometimes called the 'Chunnel', but usually only by Americans) is just like any other rail tunnel, only a bit longer. As a precaution, the yellow fire safety doors between each pair of coaches are closed during the tunnel transit, but you can still pass through freely if you want. You still get phone reception inside the tunnel now, with mobile data too. ...your train arrives in Paris! The high-speed line to Paris ends just short of Paris Gare du Nord, and the Eurostar passes seamlessly onto a short stretch of conventional line to complete its journey into Paris Gare du Nord, the historic terminus where the traditional boat trains from Calais or Boulogne used to arrive. The Gare du Nord is also the station for trains to Brussels, Amsterdam, and Cologne in Germany, and you will see red and silver Thalys trains arriving and departing from these places. When you arrive in Paris at the Gare du Nord, you get off the train and walk forward straight off the end of the platform onto the main station concourse, and either out into the streets of Paris, or turn left and head downstairs to the metro. There are no checks or other formalities to go through, you just walk off the train into central Paris, it's that easy! For the taxi rank, walk off the end of the platform onto the concourse, turn right and walk out of the side entrance. This video may help you know what to expect. See the Paris Nord station guide. In Paris, you just walk off the train onto the station. Eurostar trains from London to Paris arrive at the Gare du Nord, but your connecting train will probably leave from one of the other Paris stations. The Gare de l'Est is a 10-minute walk from the Gare du Nord, but to get to any of the other Paris stations you'll need to take the metro or RER (Express Metro) across Paris. See the guide to changing trains & stations in Paris by metro or taxi. Left luggage lockers are available in Paris. In Brussels, all long-distance trains including Eurostar use Brussels Midi station (Brussel Zuid in Flemish, Brussels South in English), so changing trains is easy. These recommended times are the minimum. Left luggage lockers and a staffed left luggage office are available at Brussels Midi (24 hours). You can still travel from London to Paris by train and ferry if you want. Taking the traditional route via Dover & Calais it now takes 9 hours and is no longer particularly convenient as you have to make your own way by taxi or on foot between Dover Priory station and the Eastern Docks in Dover, and between Calais ferry terminal and Calais Ville station in Calais. The original train/ferry interchange stations at Dover Western Docks and Calais Maritime closed in the 1990s when Eurostar started. London to Paris by train & ferry also costs more than a cheap Eurostar ticket booked in advance. However, train & ferry can be cheaper if you need to travel at short notice when all the cheap Eurostar fares are sold out, and of course you get to see the White Cliffs of Dover on the way. You can substitute train+ferry+train for Eurostar London-Paris in any of the journeys routed via Paris shown on this website, but you'll need to buy separate train and ferry tickets. Times, fares & info for travelling from London to Paris by train & ferry are shown here. There's also an overnight train-ferry-train option where you can leave London Waterloo around 18:30, sleep in a comfortable cabin with en suite shower & toilet 23:15-08:00 on Brittany Ferries' overnight sailing from Portsmouth to Le Havre, then take a train from Le Havre to Paris St Lazare arriving around 12:10. This is not a bad option if you need an alternative to Eurostar. Times, fares & info for travelling from London to Paris by overnight train & ferry are shown here. If you're heading for northern or eastern Europe and there are major problems affecting Eurostar services, or you need to travel at short notice when Eurostar can be expensive, you can buy a cheap inclusive 'Dutch Flyer' ticket from London to Amsterdam or anywhere in the Netherlands using Stena Line's overnight Harwich-Hoek luxury superferry, including a comfortable private cabin with toilet & shower, free WiFi and satellite TV. Indeed, this can be a good alternative even with Eurostar running normally, see the London to Amsterdam page for details. You can then use www.bahn.de to book a separate onward ticket from Amsterdam to Berlin, Cologne, Munich, Prague, Copenhagen, Zurich or Warsaw. www.dfds.co.uk sail from Newcastle to IJmuiden (the port of Amsterdam) overnight, and www.poferries.com sail from Hull to Rotterdam. It's then easy to take trains from Amsterdam or Rotterdam to Antwerp or Brussels, to Berlin or Cologne, or direct sleeper trains from Amsterdam to Prague, Switzerland, Southern Germany, Denmark or Poland. You can travel in style from London Victoria to Paris using the fabulously luxurious Venice Simplon Orient Express, leaving on most Thursdays March-November around 11:00, arriving Paris Est around 21:15, fare including meals (and champagne and wine on the British Pullman) £690 per person one-way. The journey involves a train of historic British Pullman cars from London to Folkestone, a transfer by coach via the Channel Tunnel shuttle train to Calais, then a superbly-restored train of Wagons-Lits sleeping-cars (in day mode) and restaurant cars and lounge car from Calais to Paris. See the Venice Simplon Orient Express page for details. 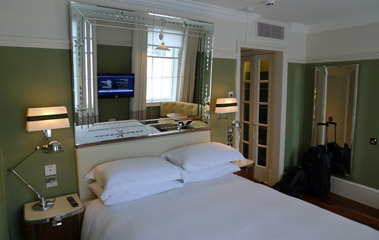 You can find a hotel in London, Paris or almost anywhere worldwide at www.hotelscombined.com, just use the search box below. There's the famous & flashy Paris Ritz in the Place Vendôme (over €490 a night) or the similarly-priced Le Meurice, but if you want a really special hotel for a luxury break or romantic weekend and can afford around €280 a night, I'd recommend the small, sumptuous, intimate L'Hotel. It's on the bohemian left bank, walking distance from the Seine, the Ile de la Cité & Notre Dame. Oscar Wilde spent the last days of his life here in room 16, famously quipping, "My wallpaper and I are fighting a duel to the death. One or the other of us has to go.". Fortunately the wallpaper is now all in very good taste. The hotel has been used by many famous people since then, from Sinatra to Mick Jagger. 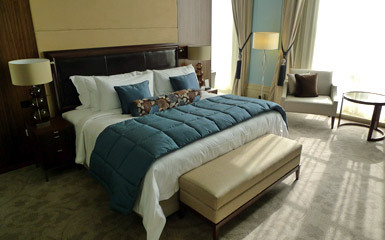 Rooms are on the cosy side, but they are beautifully decorated and have character that bigger and flashier hotels lack. Book a stay at l'Hotel. Book a private transfer from station to hotel. The distinctive light well at l'Hotel. 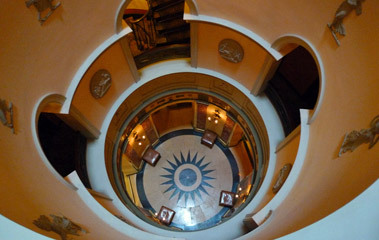 Each floor has its own circular landing. Hotels near the Gare de 'Est with good reviews: Libertel Gare de l'Est Français (opposite the station, 3-star, doubles €89); Libertel Gare du Nord Suede (350m from the Gare de l'Est, 2-star, doubles €135). Comfort Hotel Gare de l'Est (2-star, doubles €90). Hotels near the Gare Montparnasse with good reviews: Mercure Paris Gare Montparnasse (150m from the Gare Montparnasse, 4-star, doubles €175); Best Western Sevres Montparnasse (15 minute walk to Gare Montparnasse, 3-star, doubles €170); La Maison Montparnasse (10 min walk from station, 2-star, doubles €98); Hotel du Maine (5 min walk from station, 2-star, doubles €92). 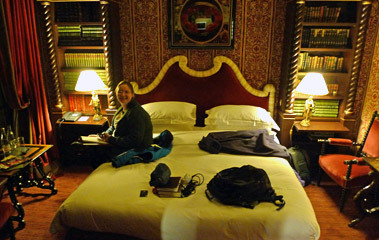 In March 2011 the luxurious, expensive and beautifully-restored 5-star St Pancras Renaissance Hotel opened for business. Designed by the renowned architect Sir George Gilbert-Scott, it first opened in 1873 as The Midland Grand Hotel, a railway hotel built into the Victorian architectural masterpiece that is St Pancras station. The hotel closed its doors in 1935, considered too large and outdated to continue as a hotel, and after a period of being used as railway offices, this beautiful landmark building was left derelict and slowly decaying. However, its fortunes have now been totally reversed. 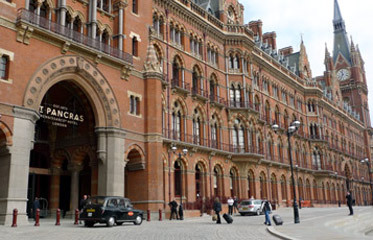 High-speed Eurostar trains to Paris leave from St Pancras station's magnificently-restored 1868 trainshed designed by William Barlow, and the once derelict Midland Grand Hotel has been reborn as a glorious 5-star hotel, St Pancras Renaissance Hotel. No expense has been spared in recreating and restoring this Grade 1 listed building to its former glory. Rooms described using the term 'Barlow' are in the newly-built Barlow House wing at the side, these start at around £250 a night. Rooms described using the word 'Chambers' are in the original St Pancras Midland Hotel building, where rooms start at around £486 a night, rising to suites costing several thousand. You can of course, just have a drink in the bar or meal in the restaurant, accessible from the south west corner of the upper level concourse, the same level as the Eurostar trains. The bar-restaurant is housed in what was once St Pancras station's booking office, the Grade 1 listed wood-panelled booking windows are still there behind the bar, and it still says 'Booking office' in the stones above the entrance doors. The hotel lobby has been built in what was once the station's taxi rank. 5 stars... The magnificently-restored St Pancras Renaissance Hotel. Above left: A Chambers room. There are plenty of cheaper hotels near St Pancras Station, including the Premier Inn St Pancras, Alhambra Hotel, MacDonald Hotel or Crestfield Hotel. 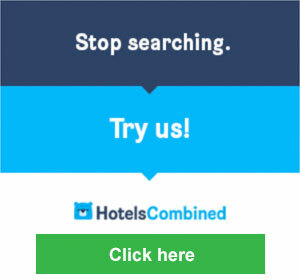 Search hotels at Booking.com.